Everyone of us make small financial mistakes all the time. But since they’re small, they’re very unlikely to lead to a crushing blow. But there other money mistakes – major ones – that can definitely cause financial impairment if you aren’t careful enough to avoid them. 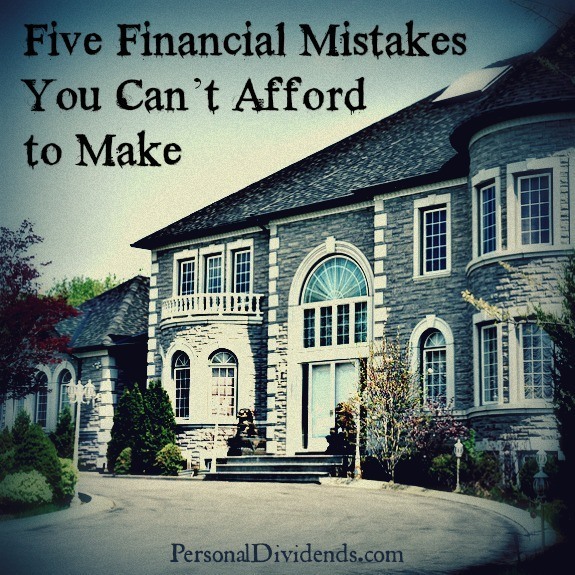 Here are five of those mistakes, that if you do make them, can cause you to fall behind financially, maybe even for the rest of your life. This is a common mistake, particularly among first-time homebuyers. Most everyone wants a house that’s just beyond their ability to comfortably afford. The belief is that by buying a little above your means, your income will eventually increase, making the carrying cost of a new house more affordable. If the expected career advancements, or increases in pay, don’t materialize, you’ll be stuck with an outsized house payment for years. An expensive house is a controlling cost, which is to say that other expenses will be increased by the cost of your house. That will include taxes, utilities, insurance, and even the cost of repairs and maintenance. By buying a house that’s at least a little bit below your ability to pay, you ensure that you always have extra money available for non-housing expenses. This is the best way to stay out of debt, to build up savings, and have greater control of your finances. This is another financial decision, often made early in life, that can have incredible implications for the rest of your life. In today’s world, it’s very easy to adopt the buy now, pay later attitude. You use credit to buy what you can’t afford to pay for out of your earnings, under the assumption that you’ll get control later. That’s using debt as an extension of your paycheck. But when it comes to debt, later seldom makes things better. This is particularly true if you make frequent use of debt. The total amount of debt owed can become unwieldy, making it almost impossible to pay it back in the normal course. This is a Catch-22, and even if you are making more money later on, the increase will almost certainly be consumed by the debts that you’re running up right now. As a rule, debt should only be used to pay for major assets, like a house or a car, that will provide benefits for longer than the term of the loan. Plan to pay cash for everything else. There are all kinds of reasons why people go into the career fields that they do. But often, those reasons have nothing to do with personal choice or preferences. A lot of people find themselves working in careers that they don’t even like. Often the reason they do this is because they choose a career based on the expected compensation. But there are all kinds of problems with this sort of career choice. Stress is one problem – if you don’t like what you do, the career will eventually become a burden. In addition, if you don’t like the work you do, you might find yourself not being happy with your life in general. Even more important however is opportunity cost. If you don’t like the work that you are doing, it means that you won’t be doing work that you do like – which is also probably the work that will have the greatest income potential. In this way, working in the wrong career and simply toughing it out, can actually cost real money. And that’s not to mention the misery and stress that go along with it, and that are often accompanied by extraneous spending in an attempt to deal with boredom. Becoming a saver – or not – is probably a make-or-break event in life. If you become a saver, you always have liquid savings, you can have less debt, you’re in a better position to invest, and early retirement is far more likely. If you never become a saver, you commit yourself to living paycheck-to-paycheck, living a life of perpetual debt, and quite possibly you’ll never be able to retire. Not becoming a saver could be the single biggest financial mistake you can make in your life. Having savings is virtually the key to all good financial things. If you haven’t been a saver up to this point, recognize how important it is, and make the change right now. When the stock market climbs to perpetual record highs, that’s when most people are in the market. Reckless abandon pushes out caution, and people load up on stocks. The problem is that they’re doing it at the worst possible time. They’re buying stocks at record prices. Eventually, every stock market bubble bursts, and when it does, the damage is greatest the closer you bought to the top. Develop the discipline to buy more heavily after a protracted sell-off, and buy more slowly – or even to begin taking profits – when the market is in record territory. While it may not be possible to time the market with any precision, it’s pretty easy to know when stocks are expensive, and when they’re cheap. Adjust your buying habits accordingly, and you’ll reap the benefits on both sides. You hit the nail on the head 5 times Kevin. Many lives would be greatly improved by avoid just these five mistakes. As an investment manager, I especially like #5 because it’s so pertinent to what is happening today.